Any Suggestions For “My” Outdoor Space? In the almost seven years that Matt and I have lived in our condo, we have never really utilized the patio space that’s just outside our front door. And really, nobody else has either. In those years, I could count on one hand the number of times that I’ve seen someone out there. One person would sit there to play his guitar, but he’s been gone for at least three years. Another person would sit out there and smoke his cigarettes, but he’s gone also. And that leaves me. I use the patio quite frequently. It’s where I do my spray painting, staining, occasional building, etc. 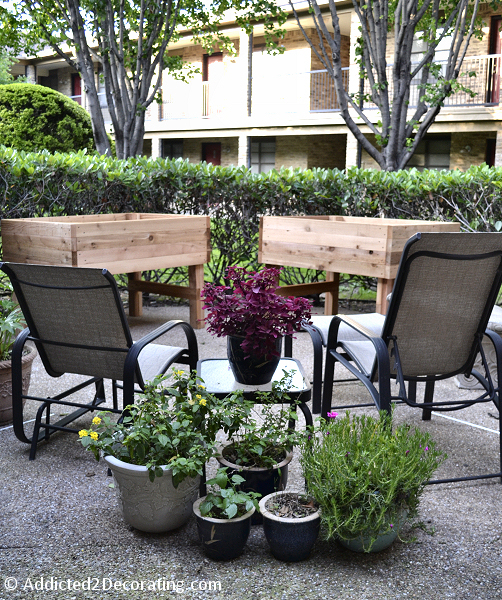 But I’ve never actually used it as a patio–a space where we can relax and enjoy the outdoors. So this year, Matt and I have decided that we’re taking over. As condo owners, we don’t actually “own” any specific outdoor space. But since this is so close to our front door, and since I’m the only one who ever uses it, we’re going for it. Of course, any other resident is free to enjoy the space as well, but I’m taking it upon myself to make it comfortable and pretty. Of course, there are the two elevated garden beds that I built (that still have nothing planted in them…hopefully I’ll get that done today). And then the chairs, table, and plants came from our neighbors who were moving stuff out of a house that they’re selling, and they happened to have this comfy patio furniture. The last time the mowers were here, I had them cut back the overgrowth on the hedges about a foot, so we gained even more space in the patio area. The hedges still don’t look great. I think they’re still way overgrown, but I hesitate to get them to cut the height down any because I kind of like how they keep our little gardens hidden away from most everyone else in the building. There are currently two concrete benches on the patio (one on either side of the gardens…only one can be seen in the photo below) that are just taking up valuable space. I want to move those out to make room for other prettier things, but I tried moving them myself the other day, and they weigh approximately a thousand pounds. 🙂 Okay, that’s probably a slight exaggeration, but suffice it to say it’s way more weight than I can move on my own. So while this space is definitely more comfortable than it’s ever been, and we’ve already spent much more time out there this year than we ever have in the past, it’s still looking a little blah to me. I really want it to look beautiful. And of course, I don’t want to spent a lot of money to make it so, especially since I don’t actually own it, and it’s very possible that once I get it looking beautiful, others will want to start using it. What do you suggest for “my” little outdoor area? I feel so out of my element trying to decorate an outdoor space when I haven’t really had any outdoor space of my own in seven years! And please, if you have a beautiful outdoor space of your own that you think might serve as inspiration for me, leave a link in the comments! I’d love to see it! You could get some shephards hooks and plant in thr shrubbery then hanging baskets of cascading flowers…. An outdoor rug would be fabulous – add some color! 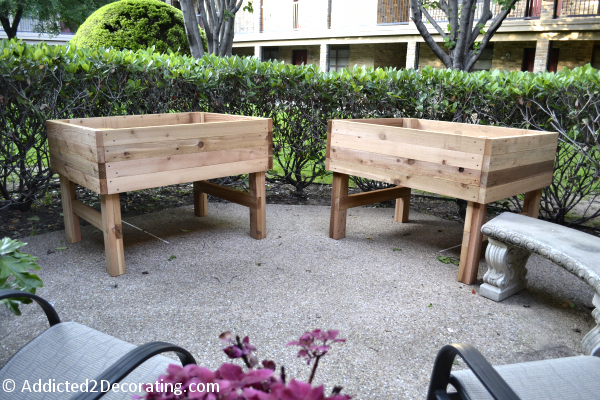 Maybe you could paint the raised planters or add a fun effect- stripes or chevron. Or paint a bunch of terra cotta pots. 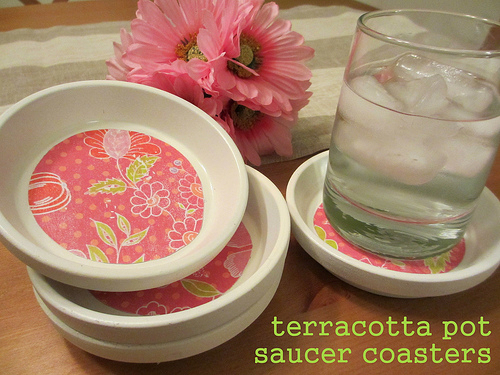 And of course, you need a cocktail on that table to make it the perfect space! You could paint the boxes. I do like the natural look of them. I would go with something earthy looking. You could add some decorative wood to the sides of the boxes and paint them a different color. I keep thinking of your jars with the jute wrapped around it. I think it would look neat on the boxes with the wood decoration. The biggest thing I see though, is your bushes look leggy and so do your planting tables. You need to fill in that space a bit. . Pretty storage under the tables or benches that can be pulled out for company. or a storage bench! I think it looks very nice as it is! If you could get some help to relocate the concrete bench, finish your vegetable and herb plantings… then sit back and let nature fill in the rest. Once your garden starts to grow and the potted plants start to bloom, your area will fill in nicely. If you wanted to expand your growing area, maybe a rolling/pull out tray under each planter box for something low growing/spreading – either eatable or decorative. Of course, you may need to keep the concrete benches to sit on, when other residents discover your little slice of beauty! Sunpatiens, petunias and other brightly colored flowers in the boxes with begonias and impatiens in pots under the boxes and around the outside a bit. In the “corner” between the boxes, something tall like a potted tree with more flowers planted in the pot or in pots around it. You need height there. A focal point. You could eave the stone benches and instead of having them as seating areas, they could hold more potted plants and a few garden goodies – a pretty but useless bird house, a small bird bath, etc. A bird feeder on a crook stuffed INTO the shrubs would allow for visiting birds to feed and feel a bit secure, and they’ll play among the leaves of the shrubs, entertaining you. Since I’m big on privacy, if it would be allowed, I would have tall trellises on the backs of those planter boxes and plant clematis or honeysuckle to fill in and offer more privacy, then put my pretty scented bloomers in front. A trellis on the boxes would also be a good place to plunk a bird house or two – pretty to look at and potentially useful for the birds. The chairs and table work but add a round outdoor rug or paint the concrete to simulate an outdoor rug. Makes it more intimate and invinting. 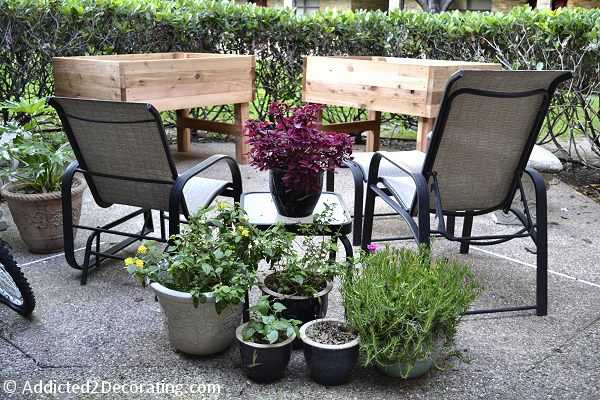 Definitely go for an outdoor rug, a small table & maybe paint those planter boxes. it would be nice to have a small table that you could use for meals out there — if there’s any shade! Maybe a small fire pit. Definitely some lanterns with candles for evenings/cocktails. I think you need some lighting. You could do some candle lanterns or string some outdoor lights if there is an outdoor plug nearby. I am going with the paint the planter boxes club. I think some pops of color would really brighten up the space, then when there is greenery in them, it looks even cheerier. I would maybe just go with a low table, you can prop your feet up and put a plate on your lap! Do you have a little more space? Have you considered an outdoor fire pit? They are so affordable now, and really make an outdoor space cozy. You can get nice ones that are small and can easily be moved out of the way when you aren’t using it. Regardless of what you do, I am sure it will look fabulous like everything you have inside! This reminds me of when we sold our house and started down a new path in church ministry. We found a home to rent (temporarily we thought) in a great location. But, the yard was in rough shape and there was NOTHING. I wasn’t going to do anything except get the grass in shape and put out some nice containers of flowers. But, I was called on to tend someone’s huge English garden and greenhouse for a few weeks. I hadn’t found a job yet so I was able. But…she said that she could only pay me in plants. I decided that it would be good for me to do and I could bless her and forget the plants. I even took her plants to the farmers’ market a few times. Finally she insisted that I need to put in a garden regardless. And with that nudge I did. And wow. It did just what I needed. Gardens really lift the spirit. So, as I look at your little spot, I’m really excited for you. May I suggest that you consider your focal point. What do you visually want to look at when you sit in your comfy chairs? And keep in mind that this is an outdoor ROOM. You create fabulous indoor rooms…why not an outdoor one? I get that you don’t want to spend much money. But, good potting mix and plants just aren’t cheap…even if you can find pots. I’d be on the look out for big pots…they’ll hold more soil and therefore moisture so you can stay on top of the watering thing. And get a soil mix that has water holding capabilities. However, I’m guessing you want to plant veggies in your boxes…be sure to get an organic mix for that. Here are a couple of things I might do. Find or make some interesting architectural detailing for the boxes…give them a little whimsy with fun things you can screw on the front. and sides. See if you can create something for the space under the box. (I’m not thinking for the ground under the box, here.) Maybe you can use your yardsticks and do an upside down picket fence with a fun defined shape…paint them…or not. If that will be shady, Get creative! (Not a problem for you) Hang a funky wreath, even. Place a trough of flowers under the front edge of the box, like impatiens…or some other shady flower. Ask at the garden center what does well for your particular light setting. And remember that the concrete will make more reflection and your plants will dry out sooner and grow faster with the extra heat and reflection. If you have or can find some architectural elements in stone, etc. even a stone cat or rabbit, etc. Place it on one of the stone benches. (I hope you can find someone to help you skooch them around to a good position. And add other pots on top and around the benches…leaving a bit of room for someone to sit. I’d try to add a water feature if I could…though these can be expensive. Lowe’s usually has a pot that you can plug in that bubbles water and makes an oasis. This is lovely in the middle of a group of containers. 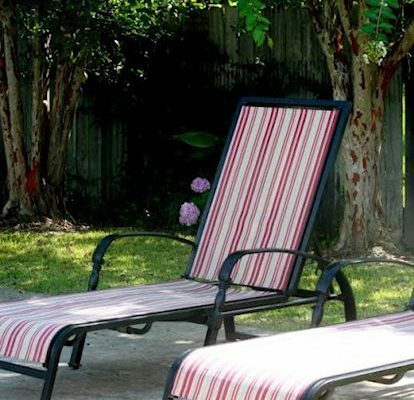 I’m picking up that you don’t want to attract people by having tallish things on your little oasis….so no suggestions here, except that I’d try to get an umbrella/stand that I can bring in when I want to. Plus it will give you a ‘roof’ of sorts to cozy it up. Add some lanterns among the pots, high and low. And a couple of pillows that can live outdoors…if you make them up…add a table square to your table. You could even put small table squares on the corners of your stone benches to unify color. And when it comes to flowers. Pick just a few colors…3 max…so that you have a bigger wow. Don’t hesitate to use lots of vines and foliage only plants/shrubs. Can’t wait to see your patio transformation. Have fun with it!!! I like everything Diane Mansil suggested, especially the tall plants (maybe palms from the houseplant section of a home improvement store for about $12 a pop, unless it is brutally sunny there), and adding a focal point, and a birdbath. I also like the firepit idea. Are you going to be the only one to maintain the area? If so, you don’t want to overwhelm yourself with watering, deadheading, sweeping, and other tidying chores. Along the same lines, unpainted planters are easier to maintain than painted ones. The flowers will give you enough color. Be sure to get annuals that will bloom all summer, not perennials that cost more and will bloom for a shorter period. Don’t get thirsty plants that have to be watered twice on summer days. In spring, it’s easy to get overextended with garden planning! If you cluster the potted plants, they might hide some of the leggy shubbery. I would face the most comfortable seats in a direction where they have something to look at — the baskets of hanging flowers, a view, or whatever else you can create. I think it’s wonderful that you are revamping this lovely little area. Looking forward to updates. If you have electricity, how about hanging cute strung lights in the trees/bushes right behind? Then you would be able to enjoy into the evening. Def paint the boxes & a rug would really add to it. You don’t want to overdo & cause yourself an extra amount of maintenance. What a cute space and I love your planters! The thing I first noticed is the lack of color. Add an outdoor rug, a couple of coordinating pillows for lounges, maybe paint the little table between lounges. Not familiar with what to plant in your area as I’m in CT, but colorful annuals to stand up and fluff out the top side with lime colored sweet potato vine to cascade over side with some flowering “draper” like mini-petunia (though petunias are a bit messy & must be deadheaded almost daily in CT) and a couple of colorful painted storage boxes under the planters even if nothing is in them. Whatever you do for rug/pillows, get something you will use in years to come! You could make some outside shelves of some sort? 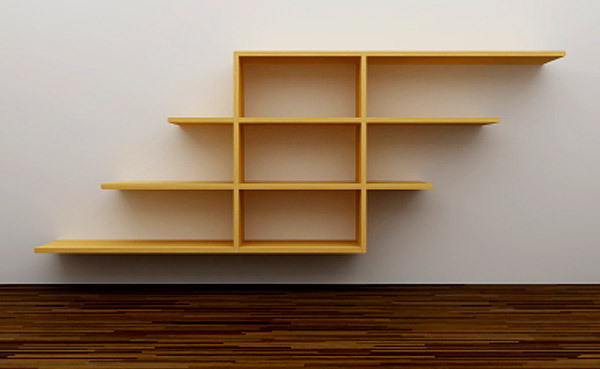 If you made something similar to this, but free standing: http://cdn.sheknows.com/articles/2011/03/spotlight/wooden-home-shelving.jpg . You could use it for storage for some supplies, and some cheap statues. 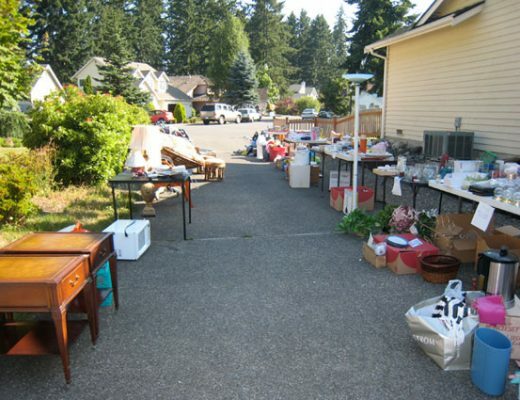 you could even invite your neighbors to put some stuff on it. I really don’t think you need to build shelves or paint your beautiful planter boxes. Just be sure to treat them with something so they don’t rot. Be sure they have proper drainage. Over the years, I have learned to love perennials, the kind of flowers that return and bloom every year. I would fill the box planters with different colors of echinacea, aka “coneflowers,” : purple, orange-red, yellow w/ brown button middles, and pink. They spread, get to be about 3 and 2 feet tall,(check labels and plant the higher-growing ones in back.) They’ll return each year with no maintenance. Something to hang over the edge and give some round shape would be nice. Try the fast spreading and perennial Golden Creeping Jenny, or German Ivy (Senecio mikanioides,) or variegated plectranthus. If these names seem daunting, visit a real nursery, and tell the owner you need something small, perennial, which spreads and will hang over your box. You’d be amazed how much help you will receive! Keep the bench!! place the more old-fashioned pots on the sides of it. Eventually, you will have an older, quaint little area, and a more modern spot right next door. You’ll be amazed what you can do with very little space. you can store your tools and pots under the boxes if you want. I don’t think you need to invest in anything but good soil and good flowering plants right now. Outdoor rugs tend to mold. Keep it simple. Have fun! These are just gorgeous, as people would have already commented above. The one thing that I’d personally like to see would be the box to be painted. Everything in the combination looks just perfect except the box which looks a bit bland among the others. If done, I bet this’d be a masterpiece. Looks great, maybe one of those small tabletop fireplaces to cozy it up in the evenings!